Most property owners want some degree of privacy between them and their neighbors. What better way to get that privacy than by using a plant that will be both aesthetically pleasing and provides a buffer between you and the rest of the world? Of course, we are talking about hedges. If you need a hedge that is going to provide 8’ of height, don’t plant a species that gets larger than 10’. If you need a plant that provides 20’ of privacy do not plant a species that grows to 40’. We have been in backyards where the hedge – let’s say, Leylandii Cypress – is on the neighbor’s side of the fence, 60’ tall and 10’ from your sliding glass door. It’s perennially dark in your backyard. This scenario gets played out over and over across the country to the enjoyment of people in our industry. At New Day Arborist & Tree Service, we make a good living by pruning plants that are improperly chosen and placed if only more homework had been done beforehand. In many cases the person that wants that privacy is going to make that mistake no matter what you say and there is lots of misinformation out there that pushes that decision to get the job done quickly. Laurels – many varieties that have dark green glossy leaves. These are our favorite hedge plants but make sure you pick the right one for the job. These make hedge trimming a breeze. Leylandii Cypress– Be very careful in choosing this species. we would not recommend this plant for residential lots. It gets too big, too fast. If you need 40’ of height and 15’-20’ of width it would be a candidate. The on-center(O.C.) distance should be no closer than 12’ apart and 15’ at least from the property line. Not the best plant if you want an easy time hedge trimming. Arborvitae ‘Emerald Green’ – It can be boring, but it’s hard to beat. Very little work as it matures. In fact, the biggest problem with this plant is pruning too much and not giving it enough water during the summer months. O.C. distance should be 3’ from each other and 4’ from the property line. As far as hedge trimming goes, this is the gold standard. False Cedars (Calocedrus, Thuja, Chamaecyparis) – The Thuja was mentioned above and are all great choices depending on the parameters but again, don’t underestimate or have the illusion that you can keep it under a certain height. Most of these plants want well-drained soil and don’t like to go dry in the summer months so plan on watering July, August, and September. Not a fun time trimming this hedge. Tsuga Canadensis – Is a great plant that is underutilized but is a beautiful plant used correctly. You cannot beat the new foliage in the spring. Watch out for wooly apple Aphids. A fine time hedge trimming. In some cases, we have seen Rhody species and Camellia Japonica species used. We love both of these choices, but you have to be patient. These are slower growing but, look out, they are stunners when they mature! Not the easiest hedge to trim, but they look great! Ilex species – Great choices in many cases. Slower growing but the birds love them, and many new varieties have great foliage and very low maintenance. Good hedge trimming candidate. There are more choices, but these are the ones we see most often. The good news is we have the expertise, equipment, and insurances to prune any of these plants in almost any situation. We start with hedge trimmers or loppers from the ground and move up to orchard ladders, bucket trucks, (if over 15-20’) and then the Teupen lift, 75’. Yes, you heard it 75’! This machine condenses to a 3’ wide stance and is on tracks. We can get this into backyards that have a little over a 3’ gate opening. How much growth should you take off when pruning? That depends but in most cases less than you want. When you think of pruning, you have to realize that you are making the plant work extremely hard to get over the shock of taking excess foliage off. This is stress to a plant. Cuts are wounds to a plant. Therefore the tree has to compartmentalize these cuts, (hundreds of them). That takes energy, which is stored in a plant as carbohydrates. It just makes life harder for the plant. That’s why it’s very important to choose the right plant for the job. When you prune, you are making the tree compartmentalize the cuts, and taking future carbohydrates away. However, after we accomplish the goal, we still have done three negatives to the tree. One negative is creating a wound that the tree has to use energy to compartmentalize. The tree has stored the energy with other uses in mind, but we are forcing it to use its “savings” to compartmentalize the wound. Second negative – we are removing energy that it has already created. In the limb that we take off, the tree has spent the time to store energy that it can use in the future. By pruning, we remove the potential for that energy to be used. Lastly, we remove future energy in the form of photosynthesis. Because we removed a limb with leaves on it, there is a reduction in the total potential energy the tree can create now with the loss of the leaves. Basically, when it comes to hedge or tree trimming “less is more.” It is better to prune a little this year and a little next year than to over-prune it now. The example we see all the time is the pruning of any variety of Arborvitae. When it is constantly pruned, it cannot replenish its storage of carbohydrates, therefore, it starts a downward spiral in health, and the customer will ask, what happened? We say, “You loved it to death.” Many times the plant will be begging for you to leave it alone! The yards we have been most impressed with are the ones that know when “not” to do something. Back to the original question, in most cases, the answer would be no more than 20-25%, but there are many variables that would influence the percentage one way or another. 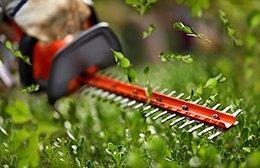 Contact us today and we will help you get your hedges under control!